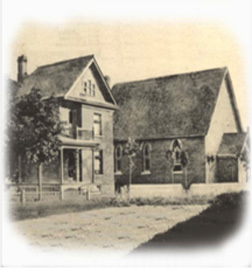 According to Coldwater United Church History, the Wesleyan Methodists began holding meetings in the school house in 1866. In November 1870 George Copeland gave the trustees of the congregation a quarter acre lot on the east side of the Coldwater Road, slightly south of Robinson Street (near the fairgrounds). The trustees at that time were John Borland, John Gill who was living in Tay Township, William Gratrix of Medonte Township, Henry Lovering of Coldwater, and John and William Lovering, farmers in Matchedash Township. Until 1885 the Methodists worshipped in a small frame church built on this lot, and then they moved to a handsome new brick structure on the south side of Gray Street on a lot bought from John Gray for $100. A Sunday School built on the east side once served as a classroom to house the overflow from the public school across the road. In 1903 a parsonage was built next door. By 1910 the congregation once again found its church too small, and so it bought a lot from Francis Craddock on the northwest corner of Craddock and Harriett Streets, where a third Methodist church went up. With seating capacity for 450, the new edifice cost $10,700 and was dedicated in March 1911. 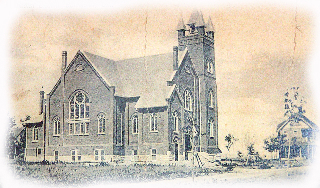 A series of fires culminated on March 26, 1923, when the building was destroyed.While a new structure was being built, services were held in the Presbyterian Church. In celebration of rebuilding their church following a fire of 1923, Mr. W.J. Sheppard (Chairman of the Georgian Bay Lumber Company) gave the church a special gift. The congregation no longer had to use a piano for leading them in hymns of praise, because Mr. Sheppard donated an organ to be installed in the sanctuary. 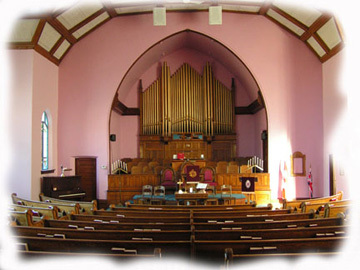 That organ was built in 1923 by the Woodstock Pipe Organ Company, and was installed in its present position when the building was completed in 1924. This installation was assisted by Mord Millard. It is with good authority that we know this as Mord's son Bob Millard remembers his father discussing the installation. After the organ was in place Mord was hired by the Woodstock Pipe Organ Company so that regular maintenance could be carried out without a person coming by train all the way from Woodstock. Mord continued to maintain the instrument until he left Coldwater in 1977 at age 77. Maybe that is why this instrument is in such great original condition. This organ is one of the last remaining instruments of its size built by the Woodstock Pipe Organ Company. According to our organ tuner, Blair Batty, this instrument is a "virgin" in that it has not been changed, or altered, in any significant way and so today stands as a unique example of the Woodstock Company's craft. This instrument was not designed as a solo performance instrument but was built to lead the congregation in hymn singing and the choir in anthems. This it has done very successfully over the last eighty plus years.